I love my Crock-Pot. I know that the Instant Pot is the new hot kitchen appliance, and while I get the appeal (and wouldn’t mind getting one soon to try it out), I will always have a soft spot for a slow cooker. Besides the fact that it’s a pretty “set it and forget it” type of cooking, I honestly just feel like everything tastes good if you cook it in a slow cooker. These stuffed peppers are no exception to that rule. While they take a little bit of prep up-front, they are tasty and hearty, so that’s a worthwhile recipe to me. This recipe is already gluten-free, can easily be made vegetarian by swapping out the ground chicken for black beans (or lentils, or protein of choice), and vegan by both swapping the ground chicken and removing the cheese. So pick your desired way of eating and make these soon! 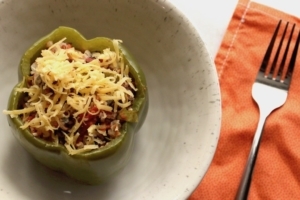 A delicious, hearty, hands-off recipe for colorful stuffed peppers. Cut the tops off of all of the peppers, remove the ribs and seeds from the inside, and rinse. Mix all of the other ingredients together in a bowl. Stuff the opened peppers with the mixture until it reaches the top of each one. Pour ½ cup water into the bottom of the slow cooker. Place the peppers into the slow cooker and cook on high for about 3-4 hours.